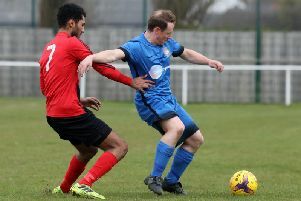 Pinchbeck United took control at the top of the ChromaSport United Counties League Division One as they won the big game of the day against Raunds Town. The only goal of the game at Kiln Park came two minutes before half-time with Ollie Maltby on target for the visitors. Rushden & Higham United produced a stunning second-half fightback as they moved up to third with a 4-3 success at Olney Town. The Lankies were seemingly heading for defeat when they trailed 3-0. But Nat Gosnal-Tyler started the comeback before Dylan Wilson made it 3-2. Jory Mann’s free-kick got them back on level terms and then Wilson won it with two minutes remaining. The local derby at Latimer Park finished in stalemate at Burton Park Wanderers and Irchester United drew 1-1. Luke Stevens gave Wanderers the lead in the second half but Matty Freeman earned the Romans a point. It was a bad day for Thrapston Town as they were hammered 6-1 by Lutterworth Town at Chancery Lane while rock-bottom Stewarts & Lloyds slipped to another defeat as they went down 4-0 at home to Potton United. Whitworth picked up a priceless victory in the Premier Division as they claimed a 1-0 success at St Andrews. The winning goal came with just six minutes remaining thanks to Remy Brittain. The local derby at the Dog & Duck saw Wellingborough Town and Rothwell Corinthians draw 1-1. Corinthians took the lead through Tom Mills in the first half but Jack Wisniewski struck after the break for the Doughboys. Desborough Town returned from Eynesbury Rovers with a point as their clash ended goalless.